A one-off project of Peter Keller (Bacillus/Jodie/Hanford), featuring amplified furniture and things to destroy them with. 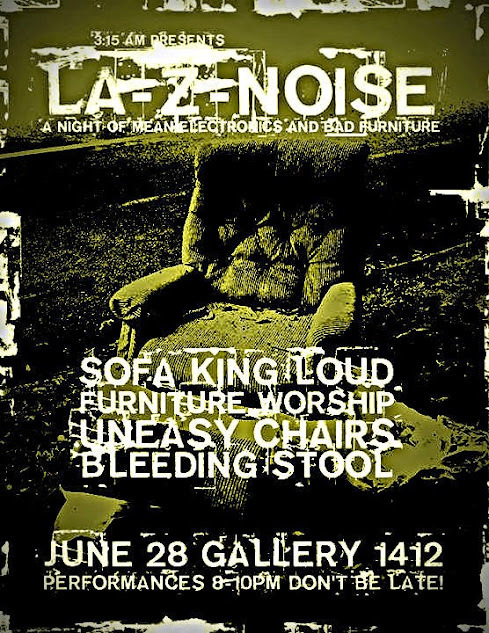 Furniture has never been this loud. Mayhem may ensue. Felicia and Abe of Pent Up Release, laying you flat with harsh noise walls as heavy and dense as a walnut armoire. Solo project of Patrick Neill Gundran (The Colour Out of Space/Jodie), electronic disorientation that you may want to sit down for. Chairs will be provided. Blake DeGraw and Jeff Anderson of Plancklength arrange a living room set of avant-garde electronics and invite along the spirit of Milo Baughman and Marcel Breuer. PERFORMANCES SIT FROM 8PM-10PM--DON'T BE LATE!